Fisherman Abakar Umaru, 40, cooks fish on his boat on the shores of Lake Chad in Tagal Village, Baga Sola, Chad on February 15, 2017. Umaru is originally from Dorom Baga, Nigeria but fled across the lake to Baga Sola in January 2015 after Boko Haram attacked his village. There are over 150 displaced fishermen in Tagal Village trying to support their families with a limited area to fish due to insecurity and a smaller market now that the route to Nigeria is impassable. 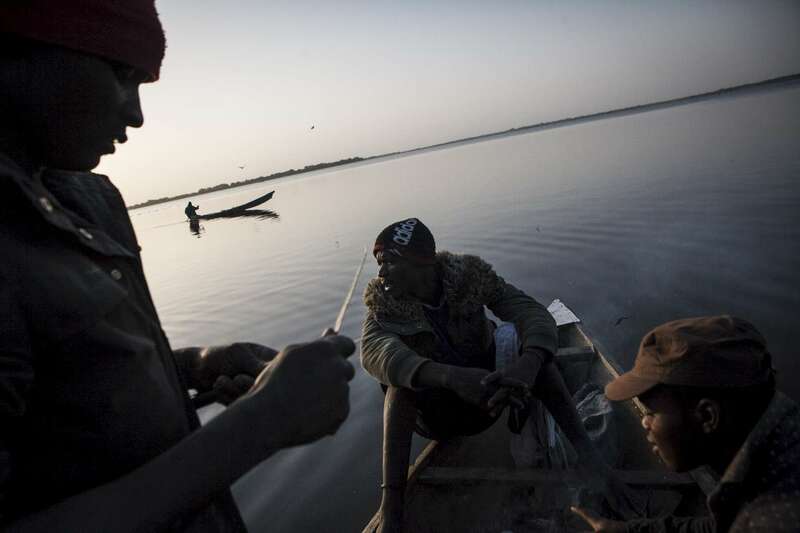 For the last two years the vital lifeline between Chad and Nigeria has been cut off due to the Boko Haram crisis, leaving fishermen, farmers and traders without their largest market - Maiduguri, Nigeria. Dozens of boats used to cross the narrow waterways of the lake each day from Baga Sola bringing goods across the border. Now most of the waterways are impassable leaving much of the population to depend on under-funded aid organizations and the charity of others.